This is my favorite "Go-To" sushi place ever, so since I come here pretty often for lunch on the weekdays, I figured I might as well write about it! 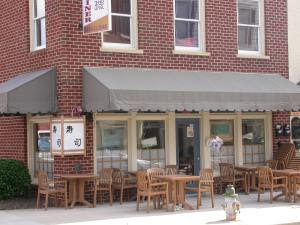 Yoyogi Sushi is located in Gaithersburg in Kentlands Market Square. There is free street parking in the front and a free parking lot in the back. Just make sure you park in a non-numbered space. The closest Metro stop would be Shady Grove on the Red Line. This is the front of the place (As you can tell I got the photo via their website because I walked through the back). During warm months you can eat outside and enjoy the nice weather. If you aren't a big fan of the sun, some of the tables are equipped with umbrellas. Usually I come in through the back entrance since it faces the parking lot. The interior in the shape of a L. It's small, cozy, and clean. Usually you can't even walk around because the place gets packed during the 'lunch rush', however my coworkers and I were having a late lunch, which is why it looks empty. Don't let the photo fool you! Lunch specials are served until 3pm. What is nice about this place is how quickly you get your food. Not everyone has a lot of time to spare during their lunch break, so everyone can appreciate their speedy service. Another coworker of mine nicknamed the place 'Super Quick Sushi'. Literally if you're in line, you better know what you're going to order because the woman at the register is fast. You order at the register, get a number to put on your table, and someone will bring your food to you in a few seconds to a few minutes. One time a coworker of mine ordered his meal, and his food was put on the table before he had a chance to sit down. Lightning speed! What is great is they have around 4 sushi chefs constantly rolling sushi, so you don't have to wait for your roll to be made after you order it. For those that don't like sushi, they also office salads, noodles, noodle soups, and meat w/rice dishes. My coworker orderered the #7 Lunch Special - Tuna roll and Yellow Tail roll for $6! This is what I usually get and I love how the fish is fresh, there isn't a lot of rice, the rice isn't old and hard, and they give big chunks of fish. My coworkers both ordered a Miso soup for $1 each! How cheap! I've had it before and it's great because they give a good amount of tofu, scallions and seaweed. My other coworker ordered a Salmon and Avocado roll off their regular menu for $4. I've had this before too and its one of my favorite. They also provide free self-serve cold and hot water. The most expensive thing on the menu is the Sushi Deluxe (6 pc. tuna sashimi & 6 pc. sushi) entree for $15. Keep in mind this isn't a fancy-dancy sushi place with elaborate/creative rolls, because their menu offers mainly standard rolls like Eel, Philly, Spider, Tuna, etc, with around 4 special rolls. I truly love this place. The people who work there are friendly and greet you when you come in. The server is a really sweet lady who will get you whatever you need and the rest of the staff is real helpful and efficient. The sushi is very affordable for the quality and freshness that they provide. Sorry this is late considering this started on Monday 1/26 but this week is Restaurant Week in Bethesda! For those who are unfamiliar with the concept, certain restaurants in Bethesda are participating and providing a pre-fixed menu for lunch and/or dinner for a fixed price of $15, $25 or $30. It's a great deal for 2-3 course meal and a fun way to check out restaurants that is usually on the pricey side. Hey Everyone! I figured I should blog about the things I've been doing over the past few weekends that have prevented me from blogging more,(ironic, I know). I hope to do this every couple weeks or month to show you a little bit more about my life. For my birthday at the beginning of the month, I invited a bunch of friends to Dave and Buster's on Rockville Pike in North Bethesda. 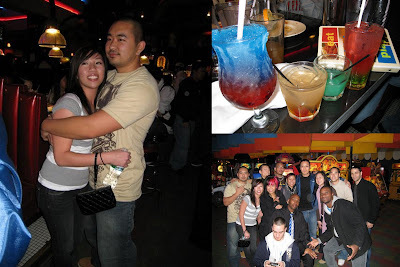 If you haven't been there before, it's basically a Chucke Cheese's for adults with video games, food and alcohol. I didn't eat anything there because the bf took me out for dinner beforehand at Guardado's. As far as drink recommendations, I liked their 'Snow Cone' and 'Candy Shop' because they just tasted like syrup. I went to NYC and stayed at a friend's place in the Bronx over MLK weekend. I was only there for one night but I love NYC. I love the tall buildings, all the people, the shopping, the food...just everything. Unfortunately I didn't have a chance to get a hot dog from a street vendor. 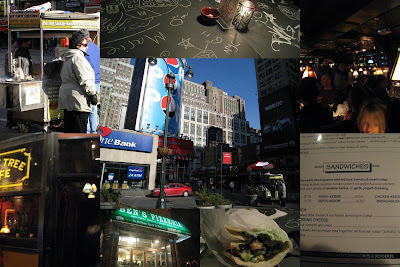 However, at night friends and I grabbed some food at Olive Tree Cafe in Manhattan, which had a delicious falafel sandwich for almost $4. My favorite part was the chalkboard table. The morning before leaving, my friends and I went to get lunch in Chinatown. We got dim sum (small a la carte dishes that come to you via a cart for you to choose from) at Golden Bridge at the intersection of Bowery and Central. 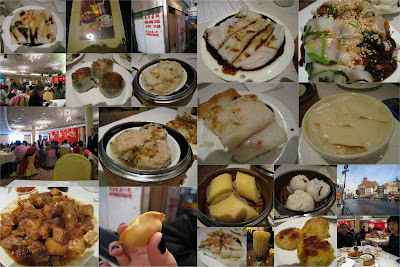 I'm not exaggerating when I say it was the best dim sum I've ever had in my life. Everything was flavored wonderfully, and I ate so much because everything was so light and delicate. I highly recommend this place! My cousin and I slept over a friend's place in Arlington in order to avoid the Metro the morning of the Inauguration. We walked 4.5 miles across the Memorial Bridge to get to the National Mall. It was a great experience, everyone was in such a happy mood, and it seemed very surreal to me. 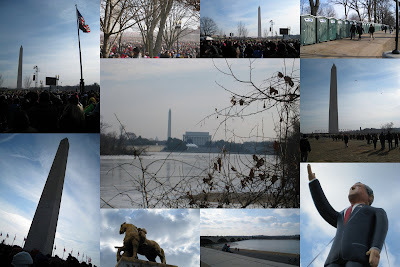 Since we got there at 10am, we were all the way in the back next to the Washington Monument. The weather was cold but beautiful. It was truly a historic day for all Americans. For my birthday, the bf surprised me and took me to this cute tapas restaurant in Bethesda. The closest metro stop would be Bethesda on the Red Line. It's located across from a metered parking garage, but there is also metered street parking available. It is a place you could miss if you were driving too fast because the sign is a bit small, and there isn't anything very distinct about the outside. So remember it is next to Hard Times Cafe. On the front window were some deals they have throughout the week. Here is my birthday self. This is the front of the restaurant. It is a pretty small place, but very cozy. It also has the nice romantic-dim lighting, which kills my photos, haha. I did like the Christmas lights around the room. However since the place is small, you can definitely hear the next tables conversations very clearly. Guardado's gives bread while you wait for your order. It was good and warm with a nice crust on the outside. I love good olive oil to dip bread in, and this olive oil was yummy and light. For those of you that are unfamiliar with 'Tapas', they are basically small/appetizer sized dishes that you share with the rest of the table. Typically a table will order a bunch of different ones for everyone to taste and enjoy. This type of meal originated from Spain and can be compared to the Chinese dim sum. We ordered the 'Croquetas Españolas- Béchamel Fritters with Chicken and Serrano Ham' for $5.95. I've had this before at other tapas places and I love it. It's a recommended dish as well as a traditional one. It tastes like well seasoned chicken stock with the consistency of mashed potatoes, then fried. We ordered the 'Calamares Fritos- Deep Fried Calamari in Our Guardado’s Special Recipe Tomato Alioli' for $7.25. Tasty, not frozen squid with a nice crispy outside. I would've prefer ed a bit more seasoning but it was good dipped into the sauce, which was similar to tarter sauce. We then got the 'Quesos Españoles- Cabrales, Manchego, Idiazabal, Murcia And Toasted Bread' for $7.25. This was a cold tapas with 4 different types of cheeses on toasted bread. 2 of them were strong tasting and 2 of them were more mild. I personally love strong/stinky cheeses. Our last order was the 'Tortilla con Chorizo- Spanish Omelet with Caramelized Onions, Spanish Sausage and Sautéed Mushrooms' for $6.95. This was really good however I was getting really full from the plates before and all the bread. This is more of a dense omelet rather than a light-fluffy one. As we were about to leave, the restaurant surprised me with a birthday flan and song. It was completely unexpected and very touching. The flan was AMAZING. It was much richer than others I've had in the past. Much more custard flavor and consistancy than just tasting caramel syrup. I loved it. Very cute, simple place with a great staff. Really friendly, helpful and warm. It's always a pleasure to go to a place where you feel like they appreciate your business and try to make you feel welcomed. The menu does serve other items than just tapas, including another traditional Spanish dish called 'Paella' which is Saffron rice and seafood mixed together in a huge pot and shared at the table. The prices range from $2.00-37.95, so it can be an affordable dinner. I would recommend this place for couples wanting a cute, but not stuffy night out, and to groups of friends who want to order a ton of food and converse over wine. Hey everyone! I'm exhaused from attending the Presidental Inauguration yesterday! It's really awesome living so close and being able to witness a slice of history. I'll post pics when I get home from work! A couple weeks ago I met my dad for our bi-weekly Sunday lunch at Pho 75. For those of you who are unfamiliar with Pho, it is a rice noodle soup in beef broth with beef toppings. Pho (pronounced 'Fuh') 75 is located in Rockville close to Montgomery College. The closest metro stop would be Rockville on the Red Line. Since it located in a shopping center there is free parking, however it is very limited. The shopping center can get crowded due to other restaurants and the fact that 7-11 and Radio Shack reserved about 1/3 of the lot. Pho 75 is (in a way) a fast food joint, so be patient because people are constantly in and out. I've been to this place many times, and it is usually packed during lunch on both weekdays and weekends. It's a fairly small place whose main focus isn't the decor but the food. There are long communal tables in the middle and smaller tables on the perimeter. The utensils and sauces are already on the table in a holder. Some pho restaurants will offer other entrees or appetizers other than pho, but at Pho 75 that is their only dish along with some drink and dessert options. As you can tell by the wall it has been recognized as a very tasty Pho restaurant in the area by Washingtonian Magazine and others. Pho 75 is also a cash only restaurant, so make sure you go to the bank/ATM or have a friend spot you. They also collect your payment at their front register instead of at the table. Once at the register you kind of point to where you were sitting and some of the things you ordered, and they'll pull up your bill. I don't know how they keep track when it's packed in there, but I guess they have a system. When ordering you have a small bowl option for $5.95 or the large option for $6.95. Let me say that the Large is in a HUGE bowl! They have prefixed meat options to choose from or you can choose your own from their choices. They have options like tripe, tendon, raw meat, different cuts of cooked beef, or Vietnamese 'meatballs'. They also offer a chicken version. I chose a small bowl with 'Tai' which is the slices of uncooked beef that cook in the hot broth on the way to your table. I love it because it keeps the meat very tender. The noodles and broth are amazing. There are 2 types of Pho noodles, thin (like these) or thicker. Personally I like the thinner ones and the chewy texture is just to die for. Their broth is what makes their Pho so popular. I feel that it has the most authentic 'home made' flavor, and doesn't taste one-noted. Another helpful note when ordering is to know what you want before you get there, haha. It really is Vietnamese fast food. Once you sit down the guy hands you a menu and pretty much expects you to order within 5 seconds. This is probably because they frequent so many regulars that just spit out their normal 'Large #1 with an Iced Coffee' without needing to see a menu. Every group of orders comes with a plate of 'fixens' including raw bean sprouts, lime, Vietnamese basil, cilantro and jalapenos. On the table there are a few sauces. A red hot sauce, a brown sauce called Hoisin which is made from beans, and vinegar. Personally I enjoy putting hot sauce, Hoisin sauce, lime, cilantro and basil into my soup. ...Give it a few minutes before removing the entire coffee dripper. Then stir the coffee and condensed milk together and pour it over ice. It's a VERY strong coffee, so the ice helps dilute it a bit. Out of all of the Pho places I've tried in the area, this is my favorite. Since Pho is the only thing they serve, they were able focus on the one dish and make it amazing. I would recommend it if you're in the mood for something quick and warm. It's not a place for a private/intimate meal since you could be sharing a table with other people. It's a great place to come with friends because it's very affordable and your Pho will come out a few minutes after you order it. Beware of the food coma that can come with eating Pho, so ordering a coffee to counteract it helps me at least. Happy New Year & Bday to me! Hi, I hope everyone is having a good start to the New Year. I recently celebrated my birthday on the 2nd, and I'll be doing a post on the restaurant the bf took me too. I don't really have any pics from Christmas but I have some from Mie N Yu since my friends and I went there for New Year's Eve. I'll be updating this week, so don't forget to come back!